The hyperbole in this one is sublime, though. Posted on March 31, 2011 at 8:37 am in Hindi film history, Hindi movies	| RSS feed You can skip to the end and leave a reply. Oh Memsaab. Of the many things I love about you and your blog of serious discussion and weighty argument, your confident glance as woman is top. I am poised, assured; life has NO SECRETS from ME. Thanks memsaab! When I used to complain about Leela Chitnis’s clingy whiny mother roles, my grandfather used to say “Leela Chitnis was a superstar in my time. She was the one on Lux soap ads”. Now I know what he was talking about! Both Leela Chitnis and Manorama look so young and beautiful! I shall go and pat Lux’s lovely lather into my skin right away. It will make your beaux yeux sparkle! Lovely. From when are these ads? We could do with one from you along these lines, memsaab, to sell your reviews. Nice to see these ads! And I have become very fond of Manorama too. 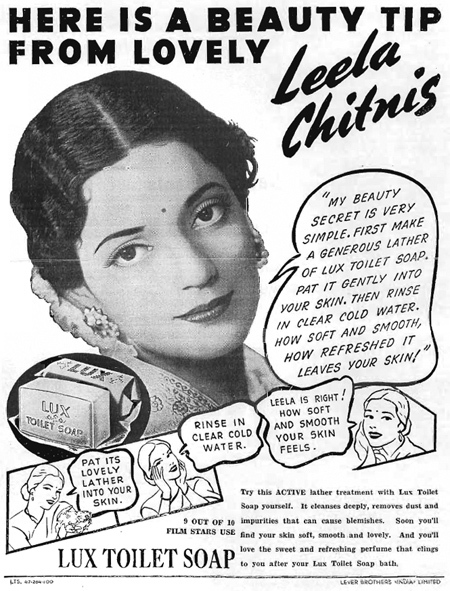 But my favorite Lux soap ad was Kanan Devi. Thank you for sharing these lovely ad pics. 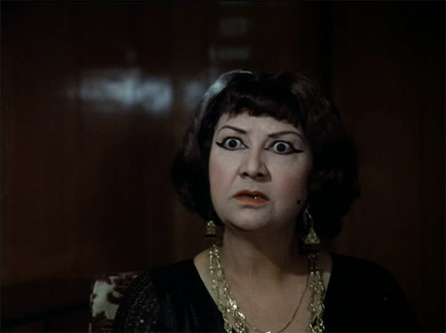 Other wise I would have an eternal image of leela chitnis as a “whinging & sorrowful” Ma in her later films! I think actresses even now consider that being a model for Lux means they have “arrived” in terms of success. I vaguley recollect seeing Karishma Kapoor and Ash on lux ads in mags. 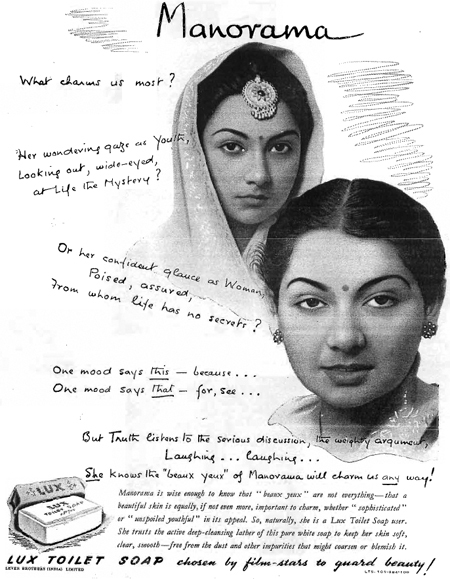 It is interesting to know that actresses did these ads for free those days. I’ve always found Leela Chitnis to be the nicest Hindi Mother. Can you imagine her as the banshee? No, it just doesn’t compute. She’s the Mother I would want if I was the hero in a Hindi movie. Lalita Pawar is the only other Ma I would consider but she’s a bit unpredictable. She can go from really happy to really angry to really weepy.. (mostly the last though). Really we should start trying to collect them…I am sure we could all together come up with quite a few, representing pretty much every decade if not every year. And you forget Shahrukh Khan. What a Lux ad that was! I like Manorama a lot. What a Chachi she made in Seeta aur Geeta. I saw her in ‘Water’ a while ago, a very, very old woman, without her wigs and eye make-up and was floored. I have not seen the Shahrukh Lux ad, but I would like to! Yes, I love Manorama. I love that she started acting as a child in the 20s, was a heroine in the 40s and was still going in the new millenium! Oh Bhagwan! I need to see that. Must Google it! I have seen some of those in old editions of Reader’s Digest. I wish the Lux people would bring out a retrospective of these advts. Even now, landing a Lux commercial means the heroine has really arrived. Yes! Let’s start a retro Lux ad campaign :) That is a long span of time and something they should be proud of maintaining even now! I wouldn’t have recognized her, but now I do see the resemblance. leena chitnis looks so beautiful. i wonder how come these actresses missed getting more films as main heroines and why they later on repeatedly accepted same type of roles in various films. alhough i loved them as villi and mother roles…in 70’s films but they could have done much better..
may be memsaab you need to write about manorma and encourage readers to post information about this actress as very less nformation is available about her. Manorama is pretty lucky (information wise) compared to others. Stalwarts like Dulari, Chand Usmani, Shakila, Kumkum, Moolchand, Ravikant, Nazir Kashmiri, Shivraj, Ram Avtar, (Ramayan) Tiwari, Habib, Rashid Khan, DK Sapru, Nazir Hussein, Ratan Gaurang, Azim, Hercules, Jerry, Krishan Dhawan, Kanhaiyalal, Kamal Mehra, Hari Shivdasani, Haroon, SN Bannerjee, Uma Dutt, V. Gopal, MA Lateef, Manmohan Krishna, MB Shetty, S. B. Nayampalli, Nemo, Kathana, Mirajkar, Dhumal, Shyam Kumar, Narbada Shankar, BM Vyas, Pardesi, Paul Sharma, Polson, Praveen Paul, Prem Sagar, Radheshyam, Raj Kishore, Raj Mehra, Mehmood Jr, Mirza Musharraf, Brahm Bhardwaj, C. S. Dubey, Keshav Rana, Mumtaz Begum, Harbans Darshan M. Arora, etc. have no information about them online. Neither do artists like Agha, Mohan Choti, Bhudo Advani, Maruti, Radhakrishan, Jeevan, Sunder, etc. though I’ve found some information in a book. upndra, eitheryou should start a blog in same manner as memsaab , and put many fotos of these actors wth the details of thier family , background , career etc… whatever is possible from that book with you. else you can give it to memsaab(she would like it for sure) as there is a hope that the way kamal kapoor and anand bakshi’s kith and kin visited memsaab’s profile the decedents of these actors too might visit this blog of memsaab and they would throw some light upon these actors. In 1960’s, a very beautiful model. Zarine Katrak,, was popularly known as the “Lux Girl” all over India. She later married her boyfriend, Abbas Khan, who entered the Bollywood film industry under the screen name of Sanjay Khan. She is the mother of film star Zayed Khan and mother-in-law of Hritik Roshan. She rarely shows in public but the people who have seen her closely say that she still looks young and very beautiful. Please, have a look at the following picture: Zarine is second from the left!! It was gem you posted here. I am a regular attendee to a Show on TVAsia USA, where on Mr.Shiraz Sharif presents a program called “Abhi To Main Jawan Hoo” where we get to see such old gems with little anecdots.